The spot where the The Duncombe House/Eilers Hotel once stood is marked by a plaque arranged by the Fort Dodge Historic Preservation Commission. It is located on the northeast side of the Fort Dodge Public Library. The Commission has installed 13 plaques at historic sites in downtown Fort Dodge. Editor’s note: This Messenger editorial was published on Saturday, Feb. 5, 1994. The immediate communitywide reaction to the devastating Eilers Hotel fire is sympathy for the family of the victim, the 15 injured, those left homeless and for the owners — the Joe McMahons, father and son — who were refurbishing the structure at substantial expense. There is gratitude and admiration for those who risked their own well being to rescue the building occupants and to fight the raging fire, preventing its spread to other buildings. Messenger photographer Tim Hynds’ dramatic picture, published on page 1 in The Messenger and as an AP photo in many other dailies Friday, showed some of them in action. There were many heroes Thursday, most of them unsung. The followup to the fire — particularly the placement of those left homeless — will call for more community compassion, concern and participation. What makes the Eilers fire more noteworthy is that in the short space of a few hours the city’s oldest business building, dating back 135 years (122 years as a hotel), disappeared in smoke and flames. First occupants were Green, Weare & Co., bankers. Then one of the early newspapers, The Northwest, and for a short time the city’s post office. From 1862 to 1866 the provost marshal “dispensed justice to military offenders within its walls,” to quote an early day history. 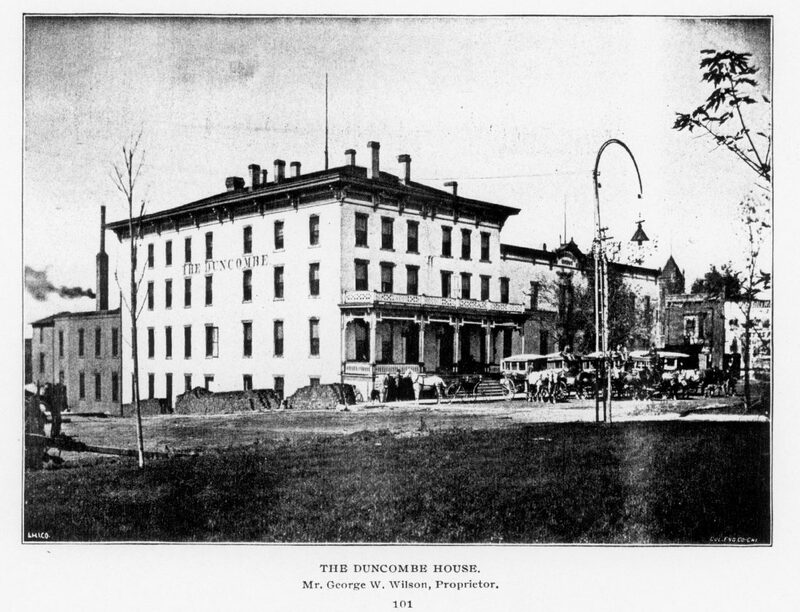 For a time it was a private residence and then, in 1872, it became a hotel — the Duncombe House was developed by George W. Wilson into one of Iowa’s best known hotels. When L. D. Eilers became owner in 1915, the name was changed to the Eilers Hotel. The Eilers and Karsjens families (Ella Karsjens was a daughter of the owners) operated the hotel for 55 years of its existence, from 1915 to 1970. The Eilers and its predecessor The Duncombe House filled an important mission for a city from its birth until Thursday’s fire. A major landmark, a place where pioneers planned the city’s early history and one which continued to figure in commerce of the 1990s, has disappeared in smoke and flames.